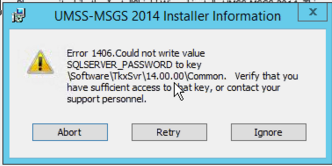 This article explains the LABEL ARCHIVE error message “UMSS-MSGS 2014 Installer Information Error 1406. Could not write value SQLSERVER_PASSWORD to key \Software\TkxSvr\14.00.00\Common. Verify that you have sufficient access to that key, or contact your support personnel.” and details how to fix the underlying problem that caused it to appear. The LABEL ARCHIVE installer is unable to write the SQLSERVER_PASSWORD registry key. In the case that prompted this article, the password value entered by the client during installation started with a “#”. The TEKLYNX development group identified this as the reason why it failed.